This is a really quick and easy pumpkin soup recipe that only takes a few minutes to prepare and 30 minutes to cook. I’ve used sweet potato, carrots and celery to compliment the flavour of the pumpkin and to add to the nutrient value of this gorgeous soup. My whole family loves this soup and I am sure that yours will too! Pumpkins are really healthy, so it’s great to have lots of delicious pumpkin recipes that are quick and easy to make. 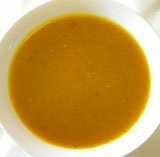 This pumpkin soup is one of those soup recipes that I am sure you will use time and time again. Let us take a look at what makes pumpkins so healthy. Beta carotene – a powerful antioxidant and anti-inflammatory which helps prevent cholesterol building up on arterial walls, reducing the risk of heart attack and stroke. Alpha carotene – which helps to prevent cataract formation and slows down aging. Fiber – essential for a healthy colon and digestive system. Zinc – improves bone density and boosts the immune system. Zinc is also crucial for reproductive health. Potassium – helps to guard against high blood pressure. 1. Chop all the vegetables and put them into a large pot. 2. Add the stock and bring to the boil. 3. Simmer gently for 30 – 45 minutes or until the vegetables are all soft. The cooking time will depend on how thickly the vegetables have been cut. 4. Liquidize the soup until smooth. You can serve this soup with a swirl of cream or for a healthier option, use natural yoghurt.